If you live in the Mount Rushmore State, where is a good place to increase your makeup skills? If you'd like to begin a professional journey as a makeup artist, or simply learn a few new makeup skills, here are the best places for you to go. Schools for Fashion Makeup Artistry. If you're looking for a school that teaches ONLY makeup, this is the place you're looking for. Makeup schools teach all sorts of application techniques and styles, but they also teach the "professional" aspect of the business, including how to run a smaller free-lance business, how to create and use a professional network, how to work with photographers, models, and managing directors, how to assemble a professional-grade makeup kit, and so on. The bad news about these schools is that they can be costly--$10k to $20k is not uncommon for a full-length program--and not every city and metropolitan area has them (although that may change in the coming years!). Cosmetology Schools. Another tremendous opportunity if you want to be a makeup professional. Where makeup-only schools go into great detail about makeup, cosmetology schools will provide you with an introduction to a number of different beauty skills: you'll learn how to cut and style hair; how to provide skin care and skin care routines; how to apply makeup in different styles, and to clients with different skin types and shades; how to perform professional-looking manicures and pedicures; and how to help run a beauty salon or beauty spa. These are a more affordable option than makeup-only schools, and there are usually one or two beauty schools in every city. Because cosmetology schools is a big-ish commitment--it'll take a few months to finish a training course--this is a great option if you're looking for a full-time career in beauty. Private Makeup Coaching. This is a superb (and very fun) way to learn about makeup artistry. Instead of going to school, you can contact a makeup artist nearby you, and ask for 1-on-1 coaching. This requires much less of a commitment, and you probably won't be able to learn enough to start a career, but you'll definitely learn a few "tricks of the trade," and you can even ask the artist about her professional experience, and what she/he has learned. You can check in Sioux Falls, Pierre, and Rapid City (those are the cities in South Dakota that have the highest population) but you can also check in your town or neighborhood. Open up your own makeup shop, and provide makeup services and classes to people in your community. Keep in mind, makeup can be a very "regional" job. In other words, there are certain parts of the country where certain makeup industries are located. For instance, if you want to get into movie makeup, Los Angeles is the place to be. For fashion makeup, NYC is probably the place to be. That said, you can be a makeup artist--and definitely a part-time makeup artist--anywhere you'd like. There is a fashion scene in every city that requires makeup artists, and in EVERY city there are brides who are looking for talented bridal makeup artists. We've written a lot about making a living doing makeup, so take a stroll the pages and see what you can find. And, as always, if you have any questions, send us an email! We're here to help in any way we can. Talking about licenses gets a little technical, but it's important. As you may know, most beauty professionals need a license to work. If you're a hairdresser, you get a cosmetology license; if you're an esthetician, you get an esthetician's license; if you're a nail tech, you get a nail tech license. But what about makeup artists? What do they need? We consulted the website for the South Dakota Cosmetology Commission, and it seems like the answer is, "It depends." It depends on where you want to work. We could not find any documentation about the licensing of makeup artists in South Dakota. So it would seem that if you want to be a "freelance" makeup artist, and provide makeup services for brides, models, actors, and so on, you do not need to get a makeup artist license (although it may be a good idea). However, if you work in any kind of establishment--like a beauty salon, or any kind of day spa--you'll need to get a license (either a cosmetology license or an esthetician license should do it). If you have questions, contact the South Dakota Cosmetology Commission at (605) 773-3101. They are the state-appointed group that enforces all the laws and statutes related to the beauty industry in South Dakota, so they can provide you with guidance should you have any questions. The Board may eventually get more strict about making makeup artist get licenses (other states have actually done so), so check in with them if you want to know more. 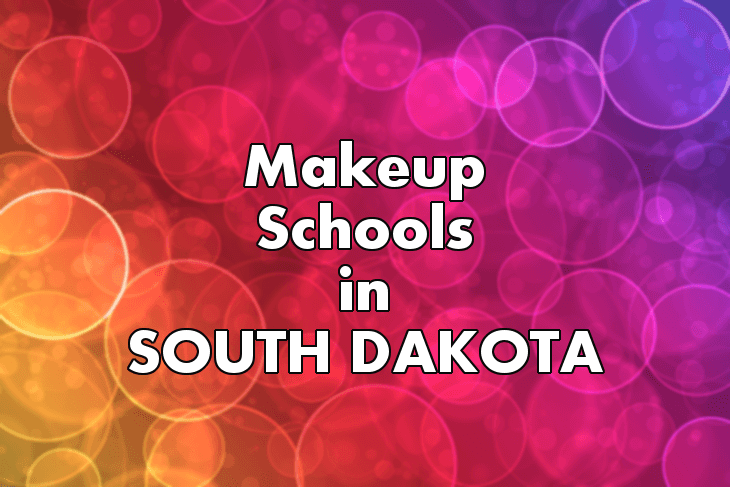 Unfortunately, we could find no makeup schools in South Dakota.